Gosh, I love this series. 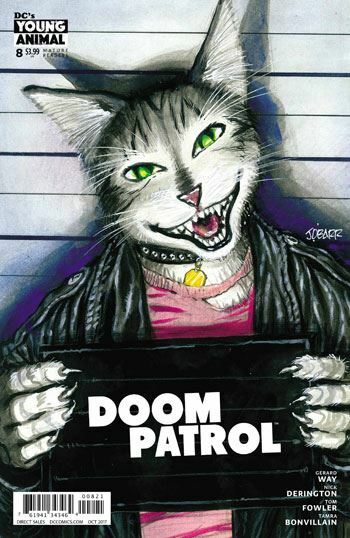 Gerard Way hit the right notes from the get go in this incarnation of the Doom Patrol. Issue 8 begins a new storyline. For the most part, this issue just features members of the team, and supporting cast members to the side. Action-wise, not a lot happens. But that does not mean this is a dull issue. Not even close. Way expands his cast a bit, and makes things even stranger. It’s also a fairly mournful issue, and nothing seems to be going right for anyone. For a variety of reasons, most of the characters feel unloved, unconnected, abandoned or shoved to the side. They reach out in many different ways, none of which seem to be promising in the long term. And with a cast of such odd people, things, and animals, these characters, their wants and needs, are all so powerfully real. From Casey being told she does not really exist to Lucius begging for some magical power to make his parents notice him, there is a lot of real, genuine pain in this story. I have just made this issue sound like the most tedious, heart wrenching thing imaginable. It’s not. Truly, it isn’t. Way is too good a writer to sink into such pathos, and credit is also due for Derington and Fowler. There is a lightness to the art which helps achieve the balance the story requires. It’s not like the art is silly and goofy. But often the visuals do bring a smile to ones face. 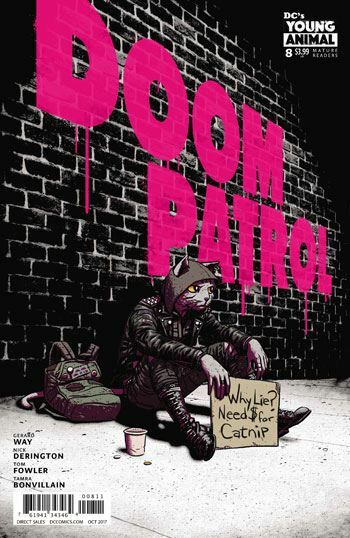 How can one not love Lotion, the homeless cat-man who looks to bring nothing but trouble with him? He’s just so cute, in a dangerous, scruffy way. I’m really not sure where Way is going to be taking this plot. All I know is that bad $#!+ is on the way.